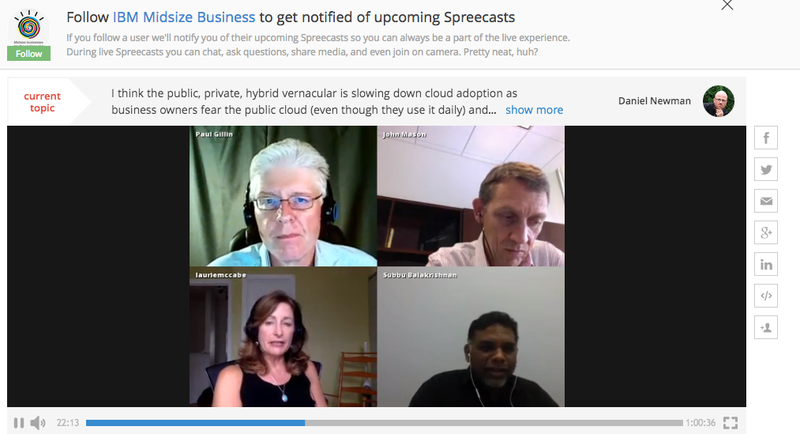 Last week, I had the opportunity to be a panelist on IBM’s first virtual influencer event on Spreecast, (a great new platform that connects you with people through video conversation) about how the cloud can help small and medium businesses (SMBs) to build their businesses from the ground up, compete more effectively with big businesses, and grow. Paul Gillin, veteran tech journalist and social media expert at Profitecture (@pgillin) moderated the panel, which included me, IBM General Manager, IBM Midmarket John Mason (@jcmason), and Subbu Balakrishnan, CTO and co-Founder of Good.co (@backslash0), a career platform built on SoftLayer that helps people find best-fit workplaces and jobs. 15-20 other SMB thought leaders also joined us via Spreecast’s chat function. All panelists agreed that the momentum for SMB adoption of cloud services is rising rapidly. SMBs increasingly see that by using cloud solutions, they can focus more of their resources and money on their core business, and leapfrog slower-moving competitors. With the help of SoftLayer, Good.com went from idea to over 100,000 users in a year and a half using a credit card to pay for cloud infrastructure. According to Subbu, this is something the 15-20 employee company would not have been able to accomplish if they had to build out their own cloud infrastructure. Many startups are forgoing on premises software entirely, opting to do as much as possible in the cloud. The cloud removes technology and capital barriers to get up and running. They can skip a whole generation of software to get their companies off the ground more quickly. The cloud is quickly becoming the preferred way for startups to go. Once you’re up and running, the cloud gives you a flexible infrastructure to scale and grow the business. The rate and pace of technology change continues to increase. The cloud not only provides SMBs with the benefits of infrastructure scale, but with access to the increasingly specialized technology skills and expertise that are necessary today. There is no one-size-fits-all when it comes to the cloud. Public, private, hybrid, shared, or dedicated—each company will have different requirements for different solutions. Business partners play a critical role in helping many SMBs take full advantage of cloud services by fully understanding the SMB’s business requirements. Skilled and trusted partners can translate SMB business requirements into the best-fit cloud solution so the SMB doesn’t have to parse through all of the cloud variants on their own.